Don’t ask me what it means. Just sit back and enjoy. The inscrutable Harold Pinter is back in town, on the boards at Berkeley Rep, with “No Man’s Land,” possibly the late playwright’s most inscrutable play of them all. A starry cast, Broadway-bound, has a great time sparring in a game of power with words and those famed Pinter silences and, if you relax and don’t try too hard to figure it out, chances are you will too. 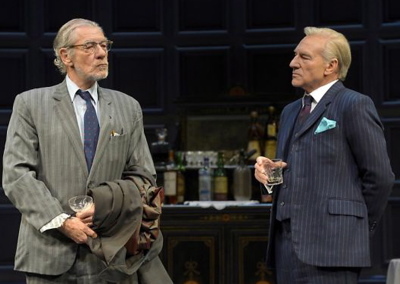 The first act is anchored by the incomparable Ian McKellen (a.k.a. Gandalf in “Lord of the Rings” and “The Hobbit” and much, much more) as Spooner, a down-and-out poet who comes home with a man he meets by chance (and not just any man but Patrick Stewart [“Star Trek, The Next Generation,” “X-Men”]) or, perhaps, not by chance. They may have been schoolmates at Oxford, as it will turn out – or maybe not. They embark on an evening of drink (lots and lots of drink) and conversation – mostly from McKellen as Stewart sits impassively, his face a mask that’s impossible to read, getting in the occasional zinger. McKellen invests his character with all manner of twitches and tics; a strange way of walking and a face that could be made of rubber. He is a perfect foil for his host’s almost catatonic calm, hilariously funny and moving pathetic at the same time. Hirst (Stewart’s character) also is a writer, but a successful one, and their encounter plays out in a spacious, elegant drawing room (scenic and costume design by Stephen Brimson Lewis), dominated by a central bar, to which the players repair again and again. A couple of old geezers chewing the fat? Maybe, but probably more. Enter two younger men, Foster (well-known stage and film actor Billy Crudup) and Briggs (Shuler Hensley, “Oklahoma” and “Young Frankenstein” on Broadway). Tough and territorial, they are somewhat threatening to Spooner (and the audience) but it remains unclear as to whether they are Hirst’s caretakers and housekeepers as they claim or his jailors. By Act II the balance of power has shifted considerably. Spooner has been locked in for the night and has slept in a chair. Briggs transforms into the consummate butler, ostentatiously serving the old derelict a champagne breakfast. When Hirst returns, nattily dressed and definitely in charge he enthusiastically describes a long-ago affair he had with Spooner’s wife (McKellen’s reaction is priceless). They begin drinking again and reminiscing about their school days and now Spooner is a supplicant, begging to serve as secretary to the more successful man, currently a post filled by Crudup’s character. And then, commanded by the two younger men, time stands still. The acting, as you can imagine, is superb and the actors are superbly directed by Sean Mathias, who, several years ago, directed Stewart and McKellen in “Waiting for Godot” (which will run in repertory with “No Man’s Land” in New York). Although nothing much happens, the evening seems to go by in the wink of an eye. How Berkeley got so lucky as to have a show of this caliber try out on its local stage is a mystery. But, like the mysterious characters and plots of Harold Pinter, it’s best not to question too much and just be grateful. “Tell me more,” begs Spooner at one point. “There is no more,” Hirst brusquely replies. And I’m afraid I have to leave you at that. Maybe there is a lot more in this enigmatic, funny, vaguely frightening play. Maybe what you see is what you get. You choose.